The Maverik Center, originally known as the E Center, is a 10,100 seat multi-purpose arena located in West Valley City, Utah. Construction on the arena started in 1996 and was completed in time to hold its first event on September 22, 1997. The arena is owned by West Valley City, and managed by Centennial Management Group, Inc.
During the 2002 Winter Olympics it served as the main venue for the ice hockey events, and as the venue for ice sledge hockey during the 2002 Winter Paralympics. Today the arena is home to the Utah Grizzlies and Utah Blaze, it is also a major venue in the area for numerous concerts and live touring productions. 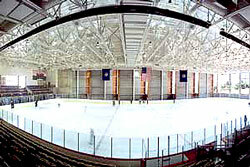 The Peaks Ice Arena has skating, hockey, and indoor soccer programs to suit any skater and athlete. A 2002 Olympic venue with two world class Olympic size ice rinks, one indoor sport court, and one large turf field. The Peaks Ice Arena offers several activities to include public skating, birthday parties, private rentals, broomball, learn to skate, figure skating, indoor soccer, and ice hockey. Home to the Peaks Figure Skating Club, several Utah County High School teams, the Brigham Young University hockey club, and the semi-pro hockey team The Blizzard. The Ice Sheet was built in 1994 as an Olympics venue for the 2002 Winter Games. Known as one of the top curling venues in the world and a proud addition to Weber County’s recreational facilities. The Ice Sheet offers a wide variety of recreation and sport opportunities in such areas as Ice Hockey, Figure Skating, Curling, and Public Skates.